Can you tell us about the decision to send rice relief for poor households before Tết? As a regular activity, at the onset of the 2019 Lunar New Year, the Government used more than 7,800 tonnes of rice to support more than 520,000 poor people nationwide to help them have a merry and happy Lunar New Year festival. 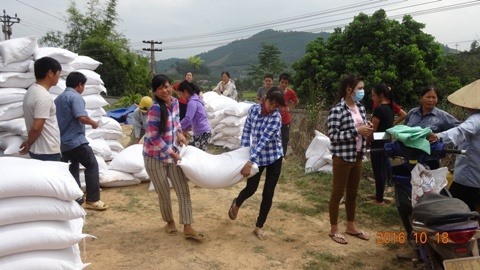 Under the Government’s instruction, each person was given 15 kg of rice. Helping the poor to have a happy new year has become a Vietnamese tradition. Are there any differences between this year and the previous years? I don’t think there was much different from this year to the previous years. Based on the requests from the 14 provincial People’s Committees, the General Department of the State Reserves ordered its branches in those provinces to prepare the required rice volume and develop plans to dispatch to the needy families before the 2019 Lunar New Year [which fell on February 5]. In the meantime, the General Department of the State Reserves has given a direct instruction to each Provincial People’s Committee to ensure no poor family would go hungry during the New Year time. Can you speak on the quality of rice sent to the households? I would say that we had prepared carefully to ensure sufficient rice volume and quality so the poor could enjoy a Lunar New Year festival like all Vietnamese families nationwide. Of course, in special circumstances, if they were requested by any local provincial People’s Committees due to the heavy and serious destruction by national calamities, we did our best to meet their requests to help stabilise political security there. The relief rice is of high quality and was carefully checked before it was transported to the localities. Did all the needy families receive their rice before the Lunar New Year arrived? By January 31, 2019 or the 26th day of December in the lunar calendar, we had completed the dispatch of 7,805.31 tonnes of rice to 520,354 people who are in special circumstances in 14 provinces nationwide. I’m very proud to say that all the rice was of high quality.